Warning! Anime keeps you from finding your inner peace! Someone in my department came up with an idea that lots of us (me, included) were too stressful on works (of course, there were no mention of the awfully too frequent nightshifts and excessive workload and the complete lack of holidays). They thought that the everyday life was harmful to the minds and spirits. And that the only way we could have our spirits and minds healed was to extract ourselves from the chaotic world. As a result of that idea, I and several of my colleagues were sent to the temple somewhere far from the busy city (I fell asleep in the bus so I didn’t know where I was taken exactly). During my stay in the temple, I had to wear only white clothes, walk around bare-footed and refrain from talking. Cell phones and laptops were strictly forbidden and I was not allowed to pack my own extra food supplies. The daily activity was simple enough. I woke up at 4.00 am (for heaven’s sake! Why didn’t they just shoot me in the head?) and spent a few hours before dawn praying and then meditating. When the sun appeared, I had to do some cleaning around the temple area before breakfast. Then the meditation resumed, I mostly meditated in sitting position but sometimes I meditated in standing position or in a slow-walk manner. After lunch, no more food was given to me. I was allowed to drink fruit juice until the next morning. In the afternoon, the monks gave us lectures and speech about how to nurture my minds and spirits along with my body, how to incorporate Buddhism into daily living, how to control my thoughts from going astray and how to keep myself from different kinds of emotion. In the evening, I meditated some more and before going to bed, there was a religious Q&A sessions with the monk. God, I was so hungry. There were 8 rules that governed my life in the temple. 2. I must not steal. This one is not so hard. 3. Refrain from any sexual activities. This one was somewhat obscure but since men were not allowed to touch or even stayed too close to women, I supposed everything was literally forbidden. 5. I must stay away from alcohols and illicit drugs. This one was easy. 6. I could not eat after noon time. That meant I had to eat my lunch like it’s my very last meal. 7. Any kinds of music, cosmetics and entertainment were prohibited. 8. I could not sleep or sit on soft bed or seat. That meant I had to sleep on the cold, dry floor. Wa…wait! No entertainment?! So now, movies, music and anime are all sinful? The whole point of this training was to make me gain better control of my mind. They said that regular daily life was full of temptation, distraction and emotion. The mind was pulled this way and that by these stimuli and the mind could not rest. Unfortunately anime, as well as movies, TV shows and music were all emotional distractions. Anime flew my mind to the distant worlds, to different emotions that I didn’t normally experience. It’s not always good to have your mind wander around. Meditation was supposed to help me keep my mind right here in my body by focusing the thoughts only at breathing. That’s a pretty good concept. If I could keep my mind at one place for longer time, I would be able to do everything more efficiently. I would not worry so much about what had happened and what might happen next because my mind stayed at the present. So there you have it. I am somewhat torn apart. I love wandering around mentally. I often create my own universe and drift in and out of it. I love doing that. What about the power of imagination? Will I ever find peace if I were a fantasy novelist or anime fanatics? I think I will have to find balance between the two scenarios; letting my mind go wild and keeping it at home where it can rest just a little bit. Again this post is more about me than anime but I hope you enjoy it to some extent. If you want to know whether I found my inner peace during my stay at the temple, the answer is no. But I might have a glimpse of it or glimpse of the path to it. I am too sinful and too normal to let go of everything just yet. I still cannot let go of anime afterall. This entry was posted in Articles, Talks and tagged anime, anime blogger, inner peace, life, meditation. Bookmark the permalink. Sound like an episode from Sora no Otoshimono Forte. Did the monk whack you with a stick when your mind wandered like in that anime? I think that would be an awesome experience though I too would find it difficult to embrace that lifestyle completely in my everyday life but rules 1, 2, 4, 5 and to a very limited extent 6 & 7 sound like good ideas to destress and bring a bit of balance ones hectic workaday world. It was nearly incompatible with life, actually! Excellent! I am so glad you got a chance to stay in a different environment for a week! Everyone should do that sometime! Most of the rules seem easy, but sleeping on the cold floor can be deleterious to your health and joints in the long term. Also I wonder why you can’t eat after noon? "I am somewhat torn apart. " The point is to have full control and awareness. Of course you can go into your own world and let your imagination bloom, but only do that when you want to (it happens automatically for some people). You have to be aware that you are not your thoughts. Mindfulness meditation is helpful because you learn to observe your thoughts rather than get too involved in them. This will teach you to respond to a situation rather than reacting, and allow you to reside completely in the present. This is especially important in the medical profession, and the recent TED talk I posted highlights this well. I am, unfortunately, the kind that has one’s thoughts automatically bloom. Though I think my biggest problems is that I think too much about the future even when I already prepare or plan for it. That does not do me any good. And I am grateful that at the least, I know about that and know how to fix that. I was born a Buddhist, but Anime is my new religion. Now I know why they can’t coexist. Now that you’ve mentioned it, monkhood seemed a bit redundant; so you do get better of your mind; to do what? Not like they’re using it to discover new scientific theories and math theorems. Seriously speaking: Monks actually do not try to discover new scientific theories. The one big thing that really matters has been discovered thousands of years ago by the Buddha. Monks just try to get to that same point. Sounds interesting to try. I want to go on a retreat for a few days to get away from work, electronics, etc. However, the no food after noon would probably land me in the hospital after a week. I have very, very low weight and blood sugar. Fruit Juice alone wouldn’t do it. I pass out after about 7 hours without food so yeah…. The question is, did you manage to learn better focus during the retreat? Personally,I think retreats are not the proper environment to learn awareness and focus. The best place to do that is where you exist: the regular day to day activities. It would be better to have someone follow us for a week of normal life and teach mindfulness there. Hmm. Sounds about close to a retreat. Retreats can help, but I think it depends on who needs it though. But well, some people do need to get away from the real world. This is a forced retreat (by the department)…I wonder if there is a name for this kind of situation? It is a good change of pace to set yourself in a different environment, even it is for a couple days. Although, with all that I am involved with, doubt I could of did the same thing for a week, but sure of would liked to try to do so. Think I would glad to abandon my PC for a week and items for week. It’s good to get away from my PC for a while, made me realized how much time I usually spent on it. This seems pretty interesting…..no women though? Can’t comply. LOL, you are absolutely right! I totally disagree. If not for anime I wouldn’t have realized I hate real women and 2D is better. Ever since this realization, I’ve worked to become a better person. To love 2D is to love yourself. To care for 2D is to take care of yourself. To learn more about 2D is to learn more about yourself. 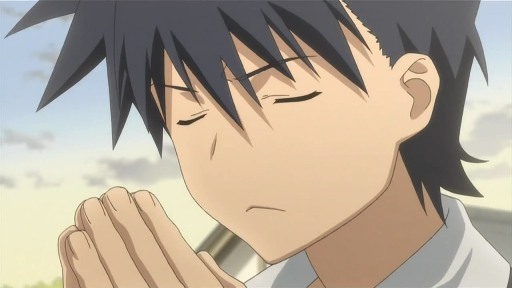 I think it’s a good thing to stay in a temple if anime prevents you from finding inner peace. deprivation of worldly things can bring inner peace since our minds can’t be attach to the things that may put us to uneasiness and worry… even to the state of euphoria are also prohibited. Man, I think someone must learn how to yoga and meditate. Wow…our work helps us de-stress by fliying us places to see the sights and drink lots of alcohol…I must admit I prefer our methods. If I was left to my own thoughts I’d probably start thinking about Skip Beat! and what will happen byu the end…that’s often what crosses my mind before bed. This was a really fascinating read! I’d love to go to a Buddhist temple, and I think I really would be up for an experience like this, spending a week to just ponder about things. Well, I do that a lot already anyways, but rooting out distractions in daily life can go a long way in bringing new kinds of thoughts into your head. Buddhism is an amazing religion, and I’ve enjoyed studying religions of the world over the years. Lots of interesting things to think about in life. It’s good to isolate ourselves from the world sometimes to think about things and by principles, we are supposed to stop thinking and let the minds go blank which leads to peace. Letting your mind go blank entirely… yes, that would be very difficult. (!!!) I can see that being a way to escape the chaos of day-to-day life though (which I suppose is an ultimate goal in Buddhism). Who is the character in the first picture ? Sorry if it’s not related, but I really want to know as I see her everywhere. 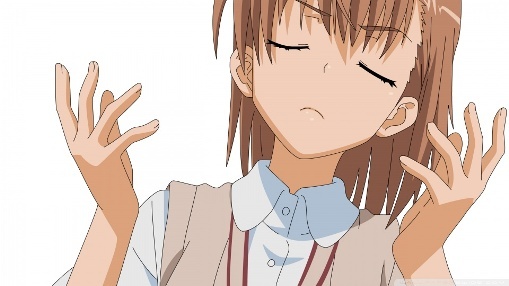 That is Misaka, from Toaru Majutsu no Index. She later got her own spinoff series, called Toaru Kagaku no Railgun.